But I think it's finally time to resurrect The Messy Beader's Club! The beads! The beads! I pull out a few tubes for one project, then set them aside in a plastic bag with my notes for the project. Then I get another idea for a project. I pull more beads, put those in a plastic bag, and set that aside. Eventually, I DO start the actual beading. But it's usually with the beads spread out all around me, in total chaos. If things start to look too neat, I sort of freak out. Even when I pull out the keyboard drawer from my desk, I've got it covered in beads and tools and supplies! 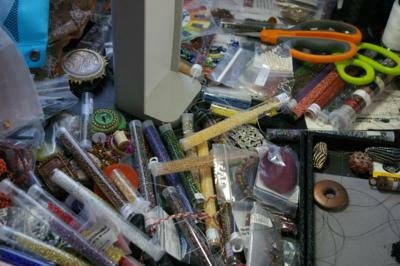 Every surface on my desk is covered with beads, projects in progress, and components that I want to use...eventually. Sometimes, I wonder if my need for chaos isn't really a need to reassure myself that I *won't* run out of project ideas. Do I need to surround myself with beads for future projects to fend off my fears that my creativity will eventually dry up? I also sort of panic when I get to the end of a project. Sure, it's immensely satisfying to have that clean beading board in front of me, with all the seed beads neatly packed away and ready for their next adventure...but...again, the fear that my ideas will dry up is front and center once I've finished a piece. I've noticed my ideas moving in a new direction the last few months, more towards things like beaded art dolls (which I've never made) and collaborating with my incredibly talented artist friend Susan Tompkins on a series of painted, collaged, and bead-embroidered wall hangings. More art for art's sake, and not so much wearable art. Along with that, I'm thinking that my new direction for 2013 should also be towards (GASP!) getting better organized and staying that way. With the bulk of my beads living in our finished basement and my current "corner office" in the living room looking like a bomb went off on a daily basis, I think it's time for 2013 to be the year that I finally get my act together and experiment to find a way of staying organized that works for me. Are you a Messy Beader, too? Are you thinking about getting organized in 2013? I am messy and yes I bead. I am also a neat freak. Go explain that one. I like to have projects organized as you do, with the bead but I only allow one project on my table at a time-some are hidden under it and others in a drawer behind it and in containers in the wardrobe (great bead storage behind CLOSED doors. I also do a lot of other things and only one of those projects are allowed out at a time...now you may be catching on.... one of this, one of that, an extra one here and there....It all reminds me that I have too much to do and really should just clean house. If my table gets clean, then I drag my feet to pull something out- because the bomb will go off again. Yes, I am a messy beader! I don't feel alone in that respect any more, thank goodness! And I do think it has to do with creative chaos--the more choices I have in front of me, the more creative and "out of the box" I can be. I am in the process of re-organizing my workroom so that maybe I won't "waste" as much time putting items back when I am done. Will that help me be more "organized"? It may help me feel that my chaos is more organized while not affecting that creativity associated with it--at least that is the plan. Baby steps, baby steps!